Diaz, M. F., Evans, S. M., Olson, S. D., Cox, C. S. and Wenzel, P. L. (2017). A Co-culture Assay to Determine Efficacy of TNF-α Suppression by Biomechanically Induced Human Bone Marrow Mesenchymal Stem Cells. Bio-protocol 7(16): e2513. DOI: 10.21769/BioProtoc.2513. The beneficial effects of mesenchymal stem cell (MSC)-based cellular therapies are believed to be mediated primarily by the ability of MSCs to suppress inflammation associated with chronic or acute injury, infection, autoimmunity, and graft-versus-host disease. To specifically address the effects of frictional force caused by blood flow, or wall shear stress (WSS), on human MSC immunomodulatory function, we have utilized microfluidics to model WSS at the luminal wall of arteries. Anti-inflammatory potency of MSCs was subsequently quantified via measurement of TNF-α production by activated murine splenocytes in co-culture assays. The TNF-α suppression assay serves as a reproducible platform for functional assessment of MSC potency and demonstrates predictive value as a surrogate assay for MSC therapeutic efficacy. Immunomodulatory activity of mesenchymal stem cells (MSCs) is mediated by direct cellular interactions and paracrine factors (Singer and Caplan, 2011; English, 2013). MSCs are believed to originate from pericytes that associate with endothelial cells of vasculature within the bone marrow and various tissues (Sacchetti et al., 2007; Crisan et al., 2008). This unique perivascular location positions them in close proximity to inflammatory and other soluble factors in the blood stream, poising them to monitor systemic signals. Indeed, recruitment of mural cells to the endothelium is a key event in vessel maturation, and pericytes play a critical role in vascular maintenance and integrity (Benjamin et al., 1998; Schrimpf et al., 2014). Pericytes likely monitor systemic signals by fluid outflow from arterioles and capillaries through interendothelial clefts or gaps in the basement membrane, which can expose the basolateral surface of endothelial cells outside the vessel to considerable fluid frictional force, or wall shear stress (WSS), that approximates intraluminal forces (Scallan et al., 2010). MSCs and other classes of pericytes might also view the intraluminal environment from openings between vascular endothelial cells by protrusion into the vascular lumen with cytoplasmic projections much like megakaryocytes, though more typically they ensheathe the blood vessel with branching processes (Shepro and Morel, 1993; Murphy et al., 2013). In instances of inflammation or injury, for example due to trauma to the central nervous system, pericytes have been shown to migrate away from microvessels concurrent with perivascular edema and toward injured tissue in association with blood vessel sprouting (Dore-Duffy et al., 2000; Göritz et al., 2011). Cells described as having features of MSCs have been detected circulating in human peripheral blood (Zvaifler et al., 2000), though there is some controversy surrounding evidence for MSCs in the circulation of healthy and even injured individuals (Hoogduijn et al., 2014). In those cases, disruption of endothelial-pericyte interactions could be expected to exacerbate vascular hyperpermeability which could impact migration or intravasation of MSCs (Mills et al., 2013). As MSCs are anchorage-dependent cells, a likely means of motility would include attachment to the vessel wall resulting in direct exposure to intraluminal WSS. In therapeutic applications wherein MSCs are administered intravenously, WSS would be an unavoidable stimulus during handling, infusion, and trafficking (Nitzsche et al., 2017). We have shown that WSS typical of arterial blood flow promotes signaling through focal adhesion kinase (FAK), NF-κB, and COX2 (Diaz et al., 2017; Lee et al., 2017). Increased COX2 results in elevated prostaglandin E2 (PGE2) biosynthesis. PGE2 secreted by MSCs plays a central role in regulation of innate and adaptive immune cells. Thus, MSCs exposed to WSS more potently suppress immune cell activation in the presence of inflammatory cues (Diaz et al., 2017; Lee et al., 2017). To quantify MSC immunomodulatory activity in cells exposed to fluid flow, we co-cultured MSCs and lipopolysaccharide-activated murine splenocytes in an adaptation of the commonly used mixed lymphocyte reaction (Plumas et al., 2005). TNF-α was measured by species specific ELISA to determine cytokine production from activated murine splenocytes, thus restricting analysis to immune cell activity and enabling separate determinations of cytokine production by human MSCs. Employing this assay as a surrogate measure of MSC potency, we determined that transient exposure of MSCs to fluid shear stress improved their ability to limit activation of immune cells in the presence of inflammatory stimulus. Preconditioning of MSCs by as little as 3 h of WSS in culture was an effective means of enhancing therapeutic efficacy in treatment of a rat traumatic brain injury model. These data demonstrate that WSS enhances the immunomodulatory and neuroprotective function of MSCs. Together with complementary studies implicating PGE2 as a potency marker of MSC therapeutic efficacy (Kota et al., 2017), our studies suggest that mechanotransduction could be leveraged to improve cellular therapies available for patients with neurological injury. This co-culture assay could easily be adapted for analysis of anti-inflammatory potency of MSCs subjected to a variety of treatments, including genetically engineered MSCs. Note: The MSCs used for this work were prescreened for the presence of typical MSC growth, appearance and surface marker expression and expanded for stock cyro-preservation prior to its use (Sekiya et al., 2002; Dominici et al., 2006). Prescreened human bone marrow (BM) MSC frozen stock at 2 million per cryo-vial, are thawed and seeded in a Falcon T225 cm2 flask with vented seal cap at 37 °C with 5% CO2. Ideal passage is between 1-5. After 2 to 3 days, 80% adherent cell confluency should be achieved for experimental use. Remove media completely and add 5 ml of room temperature sterile DPBS to rinse the cell monolayer. Aspirate out completely. Add 5 ml of Tryp-LE Express dissociation reagent. Allow volume to spread throughout monolayer and place the flask inside the tissue culture incubator for 5-8 min. Collect the cell suspension by adding 5 ml of MSC media (see Recipes) to curtail the Tryp-LE effects. Add contents into a clean 15 ml conical centrifuge tube. Re-rinse the flask with 2-3 ml of MSC media to collect remnant cells. Add contents into the same 15 ml centrifuge tube. Place the centrifuge tube into a swing bucket tabletop centrifuge (Hettich Rotofix 32A) and spin down suspension at 617 x g (2,000 rpm) for 5 min. Aspirate out the media mix using a vacuum suction, without disturbing the cell pellet. Gently tap with fingers the conical end of the 15 ml centrifuge tube, to aid in pellet disbursal. Re-suspend the cell pellet with 2 ml of MSC media by gently mixing with a 5 ml serological pipette. Once mixed, quickly take a 10 μl aliquot of cell suspension for cell counting, and place it into a fresh 1.5 ml microcentrifuge tube. Add to the suspension, 10 μl of trypan blue. Mix by pipetting 5-8 times. Take a final 10 μl aliquot of this solution and place into a hemocytometer (Hausser Scientific) with cover glass (Figure 1). Figure 1. Cell counting profile for MSCs. Example of one of the four quadrants at 200 μm. Count the four outer quadrants. Cell numbers should be close to and not fewer than approximately 30 cells per quadrant (Figure 1). Calculate the cell concentration (number of cells per ml) by the sum of 4 quadrant counts multiplied by the dilution factor of 2 and multiplied by the factor 2,500. This will equal cells per ml. Once the cell number per ml is calculated, take the required aliquot of cell suspension needed to obtain a 2 x 105 cells per ml. The slides utilized are IBIDI VI0.4 six channel slides with a channel volume of 30 μl. Add 32 μl of your cell suspension into each channel using a P200 pipettor and tip. Insert the pipette tip into the slide reservoir and inject cells directly into the channel (Figure 2A). Figure 2. Seeding method for the IBIDI VI0.4 slide. A. Pipet in cell suspension directly into the slide channel inside reservoir; B. All channels filled; C. Humidified chamber setup. If there are bubbles that have formed after adding the cells, pick up the IBIDI slide and gently tap the edge to allow the bubbles to move toward the reservoirs of the channel. Place the slide cover over the IBIDI slide (Figure 2B). Place the slide into a 15 cm Petri dish, containing a 35 mm Petri dish filled ~3 ml of DPBS (Figure 2C). Place the lid back on the 15 cm dish with the lid. Note: This setup provides a ‘humidified chamber’ for the IBIDI slide, preventing media evaporation while inside a tissue culture incubator. Place the dish inside a 37 °C incubator and allow the cells to attach for 30 min. After 30 min, take the slide out and fill the individual channel by pipet dispensing ~2 drops between each channel reservoir until the full 125 μl of MSC media is dispensed. Note: This alternating drop-wise dispensing of media for each channel helps to minimize flow disruption, which allows non-attached MSCs to attach uniformly through the channel. Leave the slide overnight at 37 °C. Prior to the WSS, the media must be replenished in each channel of the IBIDI slide. Duplicate channels for each treatment group (static, WSS, and other conditions) are required to obtain sufficient media for analysis in subsequent ELISA assays. Each channel has a reservoir port. From one end, draw out 125 μl of the old media without drawing out the 30 μl volume in the channel (see Video 1, start to 1:21 min). To the opposite reservoir port, add 125 μl of fresh MSC media. Repeat this one more time to ensure complete change of media. Wait for one hour prior to start of WSS. During that time, set up the REGLO peristaltic pump along with the 3-stop tubing, slide elbow connectors and round bottom 14 ml centrifuge tube, prefilled with 6 ml of MSC media. This is the flow reservoir that will supply individual channels of the IBIDI slide for recirculation. Each channel is provided with a separate 6 ml reservoir for WSS. The static sample does not receive recirculating medium, unless a low flow is desired or needed to maintain the health of the cells. Prefill the 3-stop tubing with media, up to the elbow connector end by adjusting the analog rate on the peristaltic pump between 25-35. 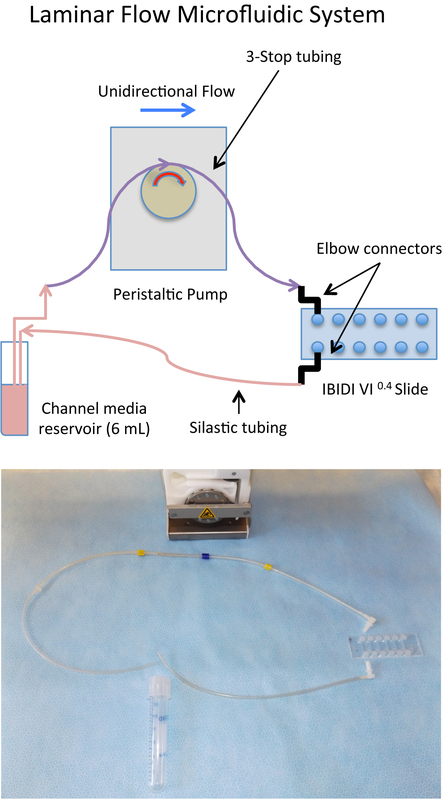 Turn off the peristaltic pump when media nears the end of the elbow connector orifice. Set and press the elbow connector to the first reservoir port of the slide. The elbow connector with tubing that runs on the opposite side, connects to the reservoir port for the corresponding channel. The end of this tubing goes into the centrifuge tube. Repeat for the subsequent slide reservoir ports. Fully assembled, the slide should resemble that in Video 1 and Figure 3. Set the REGLO peristaltic pump setting to 85, which is equivalent to 8.5 ml/min. Place the whole assembly into the incubator and start the pump after the one hour incubation period. Secure the incubator door and set timer for 3 h.
Note: There is an alternative method of WSS utilizing syringe pumps, which can minimize flow pulsatility (Li et al., 2014). At 1.25 h prior to the end of the WSS, proceed with harvesting the spleen from a male C57BL/6 mouse. Recommended age is between 2-4 months old. After removing the spleen, immerse the tissue in 10 ml of chilled PBS. Transport to the lab. Pour out PBS. Prepare a 70-μm strainer (blue rimmed) in a 50 ml conical tube. Drop the spleen on the strainer. Using a 1 cc tuberculin syringe plunger, completely pulverize the tissue through the strainer. Using a serological pipet, flush the top of the strainer, using chilled 2% FBS in PBS. Flush at most 10 to 15 ml of buffer. From the bottom of the strainer, using a 1,000 μl pipette tip on pipettor, withdraw any residual suspension of cell-buffer mix and add to the cell suspension. Spin down for 5 min at 640 x g at 4 °C. After centrifugation, note that the supernatant is turbid, but there is a ‘red’ pellet at the bottom. Pour out the supernatant, without disturbing the pellet. Add 6 ml of RBC lysis buffer and break up the pellet with the buffer using a 5 ml serological pipet. Then let the mixture sit on an ice bath for EXACTLY 7 min of incubation time. Note: If splenocyte cell mixture is left too long in the RBC lysis buffer, it may affect the cell performance. Setup the 40 μm strainer with a fresh 50 ml conical. To the cell suspension add 20 to 30 ml of 2% FBS in PBS buffer to help quench the RBC lysis buffer. Draw up the suspension using a 10 ml serological pipet and run it through the 40 μm strainer. Change serological pipet and withdraw 10 ml of FBS-PBS buffer. Rinse the original 50 ml conical tube for the RBC lysis then transfer the suspension through the same 40 μm strainer. Again using a 1,000 μl pipet tip, collect any residual cell suspension under the strainer and transfer to the cell suspension. Spin down at 650 x g for 10 min at 4 °C. Carefully pour out the supernatant and add 10 ml of the MSC media. Re-suspend the pellet and perform a cell count. There are potentially 40-60 million splenocytes extracted from one mouse spleen, so it is advisable to dilute an aliquot 1:10 in MSC media prior to taking a 10 μl sample for counting. Combine 10 μl of the 1:10 aliquot of suspension and 10 μl of trypan blue. 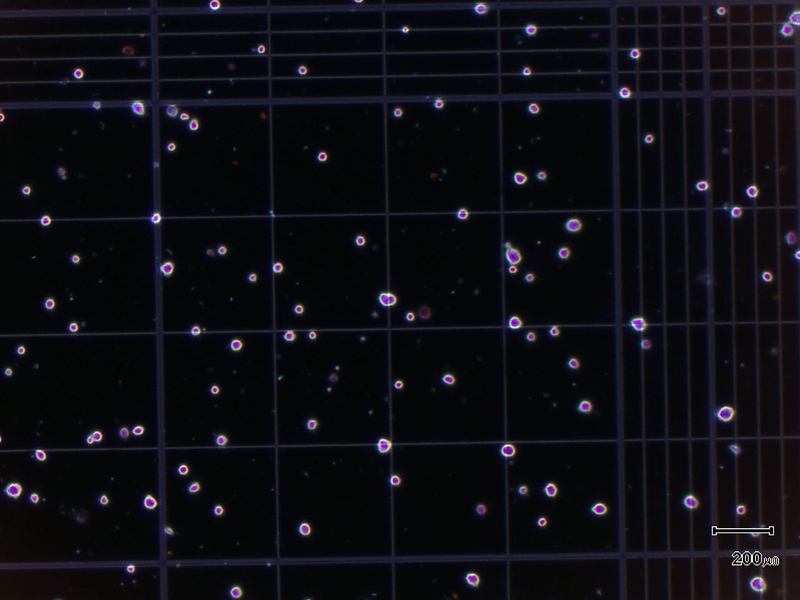 Transfer 10 μl of the stained cells and place into a hemocytometer with cover glass. Count the four outer quadrants. As before, approximately 30 cells per quadrant will provide an accurate estimate of cell concentration (cell number per ml). Once the cells per ml is calculated, take the required aliquot of cell suspension needed to obtain 6 x 106 cells per ml. Adjust volume to 1 ml if needed. The recommended ratio of MSCs to splenocytes is 1:30. After WSS exposure time is finished, disassemble the REGLO pump and channel reservoirs. Detach the elbow connectors from the IBIDI slides. Using a P200 pipettor and tip, remove the media from one end of the slide reservoir, down to the point that only the channel contains media (both reservoirs should be empty). Add 125 μl of fresh media at the opposite end of the slide reservoir, to rinse the channel. Repeat one more time. Again remove the media from the slide reservoir, but not the volume of the channel. Using a light vacuum and a glass Pasteur pipette, with a P200 pipet tip fixed at the end, carefully aspirate out all media in the channel, leaving only the MSCs. Work quickly. Using a P200 pipettor, gently mix the splenocyte suspension. Take 30 μl of this and inject into the IBIDI channel, directly into the channel as opposed to simply filling the reservoir. Repeat for all channels: static, WSS, other treatments, etc. Note: Always be sure to mix the splenocyte suspension prior to drawing for consistent cell numbers per channel. Place the slide with the co-culture into the 15 cm Petri dish used as a humidified chamber. Set the slides into the incubator for 30 min. This time is important for MSC-splenocyte interactions. You will need a splenocyte only culture used as a control for LPS treatment and non-treatment. Use a fresh IBIDI VI0.4 slide and fill four channels with 30 μl of splenocytes. Allow to incubate for 30 min with the co-cultured slides. After 30 min, fill the channel reservoirs by gently dispensing 45 μl of MSC media. Prepare a 2x concentration of lipopolysaccharide (LPS) at 2 μg/ml. The stock solution is 1 mg/ml and the final concentration in the channel will be 1 μg/ml. There will be 75 μl of media volume in the slide channels. Add 75 μl of the 2x LPS, alternating ~2 drops between each channel reservoir port until the 75 μl is dispensed for the one channel. After all channels on the slide are filled, gently pick up the slide with thumb and index finger and carefully rock it up to 10 ten times from reservoir port side to side to allow the media to flow and mix. Do not allow the media to overflow above the reservoir port rim, which causes media loss. This rocking motion allows for proper mixing of the LPS with the co-cultured cells and duplicate splenocyte only treatment group. The other duplicate splenocyte set remains untreated, with only MSC media. Place the slide cover on top of the slide and place in the humidified chamber. Place in the incubator for up to 18 h.
The mTNFα ELISA kit (R&D Systems) must be taken out of the refrigerator and allowed to equilibrate to room temperature for at least 30 min. The TNFα control and the TNFα standard should be each reconstituted with 1 ml of double deionized water. The 25x wash buffer should also be thawed. After incubation of the co-cultured cells and the splenocyte only control conditions (LPS treated and non-treated), collect the media from duplicate channels, combining together the two channels for each treatment group into individually marked 1.5 ml microcentrifuge tubes. A volume of two duplicate channels will be approximately 300 μl. Place the microcentrifuge tubes on ice. Transfer the tubes into a refrigerated table top centrifuge and spin down at 650 x g for 5 min at 4 °C. This step is required to remove any cell debris and splenocytes. After centrifugation, transfer the media supernatant into a fresh pre-labeled tube. Discard the first tube with the debris pellet. Follow the link to pages 5 and 6 of the TNFα standard preparation and assay procedure. Use the appropriate diluents for each and proceed. https://resources.rndsystems.com/pdfs/datasheets/mta00b.pdf. Note: The R&D ELISA assay procedure on page 6, steps 3 and 4, suggest to dilute you media sample 1:1 with the RD1-63 diluent into the pretreated well, in duplicates. This should be done for the TNF-α standards and control. For the actual sample, our experience has shown that undiluted sample into the well, allows for consistent pg/ml TNF-α values compared with an RD1-63 diluted sample, which can at times be inconsistent, possibly due to interfering contents in the media. We use straight 100 μl of media sample in duplicate wells for each condition, including the splenocyte only samples, both treated (with LPS) and untreated. After obtaining the values in pg/ml, final sample values calculated are reduced by multiplying to a factor of 0.5, to normalize to the diluted standard and control values, which initially are diluted. Continuing on the R&D assay procedure link from page 6, step 9, after adding the 100 μl of ‘Stop Solution’, wipe the bottom well plate surface using a paper towel to absorb any moisture from the washes and immediately take optical density readings using the Spectra MAX M2 microplate reader set at 450 nm wavelength. Wavelength correction, although recommended is not required due to the very minute difference in optical density differences related to bottom well surface imperfections. The concentration (pg/ml) for the standard and control mTNFα are factored by 1, since they were diluted by half with the RD1-63 diluent. For calculation of the actual media sample concentrations, you must include a multiplication factor of 0.5 to normalize to the standard and control. Based on the concentration (pg/ml) of TNFα detected by the microplate reader on the samples, plot an initial vertical bar graph, plotting the LPS ‘treated’ and ‘untreated’ splenocytes and the co-cultured static and WSS samples. Also, plot the TNFα positive control. Note: The TNFα positive control stock vial has a printed range of pg/ml concentration for media samples, which allows determination of whether the assay itself has worked. If the control numbers fall within the printed range of the stock vial for media, the assay is performing properly. If the assay worked well, the LPS ‘treated’ splenocyte only control will have the highest reading/concentration of mTNFα. The ‘untreated’ splenocyte control will register near zero, due to little or no production of TNFα in unactivated splenocytes (Figure 4). Note: MSCs in an un-sheared state have the ability to reduce inflammatory response or, in this case, splenocyte secretion of mTNFα. In WSS induced MSCs, the anti-inflammatory response is enhanced. From the numbers generated for mTNFα concentration, normalize all values to percentage using LPS ‘treated’ splenocytes to represent maximal capacity for TNFα production (100%). The percent reduction of mTNFα between static, WSS, or other treatment groups relative to ‘treated’ splenocytes will provide a relative measure of MSC immunomodulatory performance (Figure 5). Figure 5. Percent reduction plot comparing WSS vs. static co-culture. WSS-exposed MSCs show enhanced immunomodulatory activity. Note: Data presented in Figures 4 and 5 are from a single representative experiment demonstrating under ‘Data analysis’ the procedure for obtaining and charting TNFα ELISA assay numbers. The procedure described does not include technical replicates. Instead, we favor true biological replicates to establish reproducibility and these could include experiments set up on different days or using different cell lines. Please see our prior manuscript (Diaz et al., 2017) for a more in-depth study with statistically reproducible data for this immunomodulatory phenomena. This work was supported by grants from the State of Texas Emerging Technology Fund, American Society of Hematology Scholar Award, National Institutes of Health K01DK092365, and Mission Connect: a Program of the TIRR Foundation (014-121, 016-118) to P.L.W. Benjamin, L. E., Hemo, I. and Keshet, E. (1998). A plasticity window for blood vessel remodeling is defined by pericyte coverage of the preformed endothelial network and is regulated by PDGF-B and VEGF. Development 125:1591-1598. Crisan, M., Yap, S., Casteilla, L., Chen, C. W., Corselli, M., Park, T. S., Andriolo, G., Sun, B., Zheng, B., Zhang, L., Norotte, C., Teng, P. N., Traas, J., Schugar, R., Deasy, B. M., Badylak, S., Bűhring, H. J., Giacobino, J. P., Lazzari, L., Huard, J. and Péault, B. (2008). A perivascular origin for mesenchymal stem cells in multiple human organs. Cell Stem Cell 3: 301-313. Diaz, M. F., Vaidya, A. B., Evans, S. M., Lee, H. J., Aertker, B. M., Alexander, A. J., Price, K. M., Ozuna, J. A., Liao, G. P., Aroom, K. R., Xue, H., Gu, L., Omichi, R., Bedi, S., Olson, S. D., Cox, C. S., Jr. and Wenzel, P. L. (2017). Biomechanical forces promote immune regulatory function of bone marrow mesenchymal stromal cells. Stem Cells 35(5): 1259-1272. Dominici, M., Le Blanc, K., Mueller, I., Slaper-Cortenbach, I., Marini, F., Krause, D., Deans, R., Keating, A., Prockop, D. J. and Horwitz, E. (2006). Minimal criteria for defining multipotent mesenchymal stromal cells. The International Society for Cellular Therapy position statement. Cytotherapy 8(4): 315-317. Dore-Duffy, P., Owen, C., Balabanov, R., Murphy, S., Beaumont, T. and Rafols, J. A. (2000). Pericyte migration from the vascular wall in response to traumatic brain injury. Microvasc Res 60:55-69. English, K. (2013). Mechanisms of mesenchymal stromal cell immunomodulation. Immunol Cell Biol 91(1): 19-26. Göritz, C., Dias, D. O., Tomilin, N., Barbacid, M., Shupliakov, O. and Frisén, J. (2011). A pericyte origin of spinal cord scar tissue. Science 333(6039): 238-242. Hoogduijn, M. J., Verstegen, M. M. A., Engela, A. U., Korevaar, S. S., Roemeling-van Rhijn, M., Merino, A., Franquesa, M., de Jonge, J., Ijzermans, J. N., Weimar, W., Betjes, M. G. H., Baan, C. C. and van der Laan, L. J. W. (2014). No evidence for circulating mesenchymal stem cells in patients with organ injury. Stem Cells Dev 23: 2328-2335. Kota, D. J., Prabhakara, K. S., Toledano-Furman, N., Bhattarai, D., Chen, Q., DiCarlo, B., Smith, P., Triolo, F., Wenzel, P. L., Cox, C. S., Jr. and Olson, S. D. (2017). Prostaglandin E2 indicates therapeutic efficacy of mesenchymal stem cells in experimental traumatic brain injury. Stem Cells 35(5): 1416-1430. Lee, H. J., Diaz, M. F., Ewere, A., Olson, S. D., Cox, C. S. and Wenzel, P. L. (2017). Focal adhesion kinase signaling regulates anti-inflammatory function of bone marrow mesenchymal stromal cells induced by biomechanical force. Cell Signal 38: 1-9. Li, N., Diaz, M. F. and Wenzel, P. L. (2014). Application of fluid mechanical force to embryonic sources of hemogenic endothelium and hematopoietic stem cells. Methods Mol Biol 1212:183-193. Mills, S. J., Cowin, A. J. and Kaur, P. (2013). Pericytes, mesenchymal stem cells and the wound healing process. Cells 2: 621-634. Murphy, M. B., Moncivais, K. and Caplan, A. I. (2013). Mesenchymal stem cells: environmentally responsive therapeutics for regenerative medicine. Exp Mol Med 45: e54. Nitzsche, F., Müller, C., Lukomska, B., Jolkkonen, J., Deten, A. and Boltze, J. (2017). Concise review: MSC adhesion cascade-insights into homing and transendothelial migration. Stem Cells 35: 1446-1460. Plumas, J., Chaperot, L., Richard, M. J., Molens, J. P., Bensa, J. C. and Favrot, M. C. (2005). Mesenchymal stem cells induce apoptosis of activated T cells. Leukemia 19(9): 1597-1604. Sacchetti, B., Funari, A., Michienzi, S., Di Cesare, S., Piersanti, S., Saggio, I., Tagliafico, E., Ferrari, S., Robey, P.G. Riminucci, M. and Bianco, P. (2007). Self-renewing osteoprogenitors in bone marrow sinusoids can organize a hematopoietic microenvironment. Cell 131: 324-336. Scallan, J., Huxley, V. H. and Korthuis, R. J. (2010). Fluid movement across the endothelial barrier. In: Scallan, J., Huxley, V. H. and Korthuis, R. J. (Eds.). Capillary Fluid Exchange: Regulation, Functions, and Pathology. Morgan & Claypool Life Sciences. Schrimpf, C., Teebken, O. E., Wilhelmi, M. and Duffield, J. S. (2014). The role of pericyte detachment in vascular rarefaction. J Vasc Res 51(4): 247-258. Sekiya, I., Larson, B. L., Smith, J. R., Pochampally, R., Cui, J. G. and Prockop, D. J. (2002). Expansion of human adult stem cells from bone marrow stroma: conditions that maximize the yields of early progenitors and evaluate their quality. Stem Cells 20(6): 530-541. Shepro, D. and Morel, N. M. (1993). Pericyte physiology. FASEB J 7: 1031-1038. Singer, N. G. and Caplan, A. I. (2011). Mesenchymal stem cells: Mechanisms of inflammation. Annu Rev Pathol 6: 457-478. Zvaifler, N. J., Marinova-Mutafchieva, L., Adams, G., Edwards, C. J., Moss, J., Burger, J. A. and Maini, R. N. (2000). Mesenchymal precursor cells in the blood of normal individuals. Arthritis Res 2: 477-88. How to cite: Diaz, M. F., Evans, S. M., Olson, S. D., Cox, C. S. and Wenzel, P. L. (2017). A Co-culture Assay to Determine Efficacy of TNF-α Suppression by Biomechanically Induced Human Bone Marrow Mesenchymal Stem Cells. Bio-protocol 7(16): e2513. DOI: 10.21769/BioProtoc.2513.